Bush had an extensive career in public service  U.S. ambassador to the United Nations under President Nixon; head of the U.S. liaison office in Beijing in 1974; director of the CIA in 1976; vice-president under Ronald Reagan for two terms  before being elected 41st president of the U.S. in 1988. 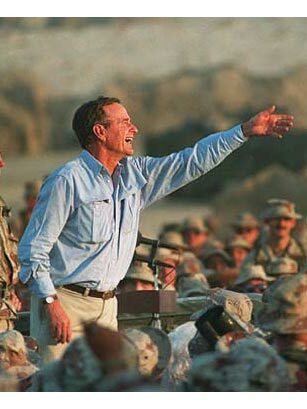 He was viewed as a president strong on foreign policy, and the perceived success of the Gulf War increased his popularity. However, his foreign policy successes did not translate into domestic ones. "Despite his virtuosity in welding the international alliance, Bush has stumbled in explaining his strategy to his countrymen," TIME magazine stated in naming Bush Man of the Year for 1990 (1/7/91). "Many Americans concluded that in George Bush they had elected two Presidents: a highly capable captain of foreign policy and a dawdling, disengaged caretaker of domestic affairs. That impression was understandable but by no means complete."